Watches can be a lovely gift for both men and women, but they can also be one of the hardest gifts to get right. There are so many different styles out there, and if you don’t really know what you’re looking for, it can all be a little overwhelming. Ed is quite practical when it comes to watches. He isn’t as bothered in how fashionable a watch looks, but more the features which make it stand out from others. 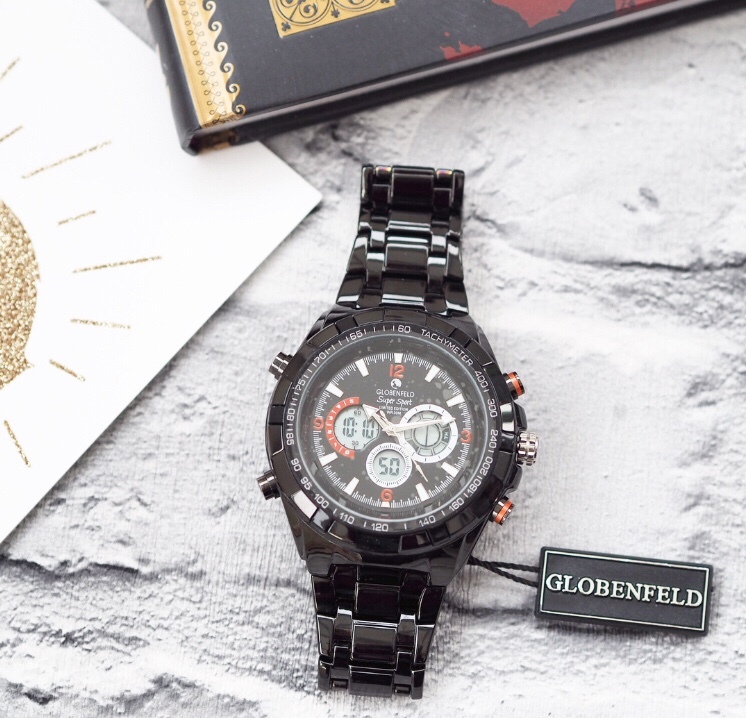 Being an active person, I figured a sports watch would be a good place to start, and when I was offered to review the Globenfeld Sports Watch, I thought it looked like something Ed would love. The watch is currently £59.99 on Amazon, with free delivery. This is an excellent price and the watch feels like it would have cost much more. I am absolutely awful when it comes to measurements, so despite there being a fairly detailed description on the website, I was a little taken aback by the sheer size of this watch. Not only does it have an extremely large face, the strap is also big as well, so as to be suitable for men of all sizes. It’s also longer than I imagined it would be. Ed explained that this was fine, it just meant needing to have the links removed to fit, but it is something to bear in mind if you are looking to give the watch as a gift (when Ed first put it on, it looked rather comical). The watch has a dual analogue and digital display. I really like how this looks. It also has a built in backlight, which is perfect for when Ed is out and about in the early morning or after dark. As you would expect with a sports watch, it has a range of functions to make life simpler including a timer, stopwatch, alarm, lap/reset functions. I also like that it not only shows you the time, but also the day, date, and month, perfect if you’re the forgetful type. Style wise, being so large, it isn’t very subtle, but again this is something that Ed has said he doesn’t mind. This particular watch is a limited edition, which Ed likes, as he doesn’t like wearing something which everyone else is. The glass is scratch resistant, and the watch has been made to be strong and durable with a reinforced band and case, which is always good when you have three young children around the house to contend with. Ed has sensitive skin, meaning that he has to be careful with the jewellery and accessories he wears. I was a little unsure how he would be with this watch, but it was fine. With Valentine’s Day just a day away, there’s still time to order the Globenfeld Sports Watch with one day delivery. As it comes in a presentation box, this watch would also be a fantastic gift for a birthday or special anniversary. I was sent the Globenfeld Sports Watch for the purpose of this review. However we all opinions and photos are my own. I love watches with a big face!! This is such a functional and sporty watch! It would make a great gift! It’s such a great gift idea for the man in your life. it looks like a really durable watch!